Background: Hamstring injuries are common in sprinters. Identifying preseason risk factors is essential to target injury-prone athletes and develop injury preventive measures. Objective: To investigate the incidence of hamstring muscle injury in sprinters over an athletic season and to explore the preseason predictor of this injury. Participants: 44 sprinters from the Hong Kong Sports Institute, the Hong Kong Amateur Athletic Association and intercollegiate athletic teams were recruited. Methods: Preseason assessment of hamstring flexibility, concentric and eccentric isokinetic peak torque and peak torque angle were obtained at the beginning of an athletic season. The athletes were followed over 12 months and were asked to report all injuries resulting from training and competition. Results: Eight athletes sustained hamstring injuries over the season. The injury rate was 0.87 per 1000 h of exposure. The incidence of injuries was higher at the beginning of the season, with 58.3% injuries occurring in the first 100 h of exposure. Cox regression analysis revealed that athletes with a decrease in the hamstring : quadriceps peak torque ratio of less than 0.60 at an angular velocity of 180°/s have a 17-fold increased risk of hamstring injury. Conclusion: Performing preseason hamstring : quadriceps peak torque ratio assessments may be useful to identify sprinters susceptible to hamstring injury. Hamstring strain injuries are common in sports involving sprinting and jumping. It has been reported that these injuries account for 50% of all muscular injuries in sprinters1 and 40% in soccer players.2 Furthermore, this injury results in time lost in training and competition.34 The causative factors in hamstring strains have been investigated extensively over the past 30 years.5 Some commonly cited causes include hamstring muscle weakness,67 poor hamstring flexibility,289 shorter optimum angle for peak torque,1011 muscle fatigue,1213 inadequate warm-up,14 previous injury6151617 and age.1617 The relationship between muscle injury and the different risk factors remains controversial. Aside from the variations in study design, interactions between modifiable and non-modifiable risk factors contribute to the discrepancies. A majority of the published literature on hamstring injury has focused on soccer, Australian rules football and rugby players.234678151617 Hamstring injuries remain a significant cause of injuries in sprinters. Unlike team sports, sprinters are required to generate maximum force and explosive movement to achieve the highest speed. These athletes also require almost 100% recovery resolution from hamstring injury before they can return to maximum performance. During sprinting, the hamstring muscles work eccentrically and function as a brake to decelerate knee extension and oppose the powerful concentric contraction of the quadriceps muscle. This eccentric contraction generates high intrinsic forces within the hamstring muscles. If the hamstring muscle is relatively weaker than the quadriceps muscle, this imbalance may increase the vulnerability to injury. This study seeks to investigate the incidence of acute hamstring injury in one of the high-risk sports, sprinting, and to identify preseason predictors of this injury. Forty-four athletes (35 men and nine women, aged 19.2 years, SD 2.0) from the Hong Kong Sports Institute, the Hong Kong Amateur Athletic Association and intercollegiate athletic teams were recruited. Ethics approval for the study was granted by the Hong Kong Polytechnic University. All subjects participated on a voluntary basis with written consent. The inclusion criteria were: (1) track and field athletes who compete in races up to 400 m; (2) involved in regular training and competition in sprinting; and (3) free from lower limb and spinal injury. The exclusion criteria were: (1) recent history of hamstring muscle injury (less than 3 months); (2) present complaint of thigh and leg pain; and (3) any medical problems contraindicated for experimental testing. The subjects were tested over 9 weeks before commencing the athletic season. After recruitment, subjects completed a questionnaire detailing demographic characteristics, running career, training profiles and previous injuries, particularly hamstring injuries. The questionnaire was self-administered with directions and explanations given at the beginning of each session. Further help and clarification was made available to the subjects. Confidentiality and anonymity was assured by the investigators. The assessment of the flexibility of the hamstring muscles was determined using the straight leg raising (SLR) test. A standardised warm-up and stretching protocol were adopted for each subject. These included a 10-minute warm-up on the cycle ergometer (low resistance) followed by 10 minutes of stretching exercises to the hamstring and quadriceps muscle. With the subject lying supine on the plinth, a Myrin goniometer was placed over the lateral condyle of the femur of the testing leg with the pointer set at 0°. The investigator then raised the subject’s leg off the bed, keeping the knee straight, to the end of the passive hip range of movement. The test concluded when the investigator feels the resistance or the subject reports discomfort. This was repeated three times 1 minute apart and the mean of the measurements was recorded as passive length of the hamstring muscle. To avoid compensatory movement, the tested knee was braced in extension and the contralateral leg was secured to the plinth by a belt. Peak torque (PT) normalised to body mass (in Nm/kg) at 60°/s (PT60), 180°/s (PT180) and 240°/s (PT240). Peak torque angle (L0, in degrees) at: 60°/s (L0 60), 180°/s (L0 180) and 240°/s (L0 240). The conventional Hcon : Qcon ratio was determined by the peak torques of the hamstring muscle in concentric mode divided by the peak torques of the quadriceps muscles in concentric mode at: 60°/s (Hcon : Qcon60), 180°/s (Hcon : Qcon180), and 240°/s (Hcon : Qcon240). The functional hamstring to quadriceps (Hecc : Qcon) ratio was the ratio of the eccentric peak torque of the hamstring muscle versus the concentric quadriceps muscles at: 60°/s (Hecc : Qcon60), 180°/s (Hecc : Qcon180) and 240°/s (Hecc : Qcon240). The hamstring to opposite hamstring (H : H) ratio was of the ratio of hamstring muscle on both legs in concentric mode at: 60°/s (H : H60), 180°/s (H : H180) and 240°/s (H : H240). For each set of the protocol, the first and the last contraction were discarded, using only the middle three contractions for data analysis. This is to avoid the possibility that the first contraction may not elicit full muscle activation and muscle fatigue at the last contraction. The raw data were then translated into ASCII text format and imported to GraphPad Prism software for the determination of peak torque and peak torque angle. The data were averaged and fitted with non-linear fourth order polynomial parameters.20 The highest reading of the fitted curve at the y axis was taken as the peak torque and the corresponding x axis value from the same point was taken as the peak torque angle. This curve fitting was chosen because changes in the torque angle curves can be described across the entire range of motion. Furthermore, the goodness of fit (R2) for the fourth order polynomial regression is the highest among other polynomial functions. Of the 792 number of fitted curves, R2 ranges from 0.83 to 0.99. Before the commencement of the main study, assessments on eight subjects were undertaken to assess the reliability and repeatability of the measurements. Recordings and measurements of the peak torque, peak torque angle and SLR of both legs were taken on two separate occasions and subsequently analysed by intraclass correlation coefficient (ICC) measures. The results showed satisfactory reliability with ICC(3,1) from 0.90 to 0.98 and 0.83 to 0.95 for the isokinetic measurement of peak torque and peak torque angle, respectively, and ICC(3,1) 0.95 for the SLR test. At the end of the testing, each athlete was given an information sheet. They were asked to report to the investigator if they have missed any practice or competition due to injury of any kind during the 2004–5 season. The investigator kept in touch with the coach and the athlete regularly during the period of investigation by phone calls. For the purpose of this study, injury to the hamstring muscle is included for analysis. A hamstring injury is defined as any injury to the hamstring muscle group that occurred as a result of running/sprinting that caused the subject to stop; and the injury prevented the subject from participating in training activities for more than 24 h. The diagnosis of hamstring injury was confirmed by clinical examination by the investigators who are physiotherapists. The date of the injury, the injury site and mechanism, immediate action taken and the number of days before recommencement of training were also recorded. All data were analysed using SPSS version 16.0 software. The significance level was set at α = 0.05. The parameters studied include the risk factors that potentially contribute to the susceptibility to hamstring injury. These include SLR, peak torque, Hcon : Qcon ratio, Hecc : Qcon ratio, H : H ratio and peak torque angle at three different speeds. Preseason test results were statistically analysed with respect to injury occurence. All variables were analysed by comparision of mean values with repect to injured versus non-injuried athletes. Comparision of mean values between the injured and uninjured group were calculated using two-tailed t tests. A Cox proportional hazards regression (or Cox regression) model was used to analyse the variables (ie, the preaseason assessment parameters) that predict hamstring injuries in this study. This model examines the “survival time” data to assess the effect of these risk factors that are significantly related to survival. The time between the date of the preseason assessment and the occurrence of the hamstring injury is known as the “survival time”. The endpoint assessed in the present study is the occurrence of a hamstring injury in the subject during the athletic season 2004–5. Recurring events were not included in the analysis. This analysis has an advantage over the logistic regression analysis because one can deduce the exposure time between the preseason assessment and the injury occurrence. Based on the assumption that the hazard ratio (HR) is constant over time, the Cox model provides an estimate of the HR and its 95% CI. Data are expressed as means (SD). Forty-four athletes (35 men and nine women) were recruited into the study. Table 1 shows the demographic characteristics of these subjects. The average running experience of the athletes was 4.7 years (SD 2.5). The athletes recruited were under regular training and competition, with an average weekly training time of 11.2 h (SD 6.9). During the previous 2003–4 season, 25 (57%) athletes reported injuries to different body parts (lumbar spine, hip/buttock, quadriceps, hamstring, knee, lower leg and ankle) attributed to running. All athletes returned to full training within 1 month except one athlete who had a tibial fracture that prevented him from training for 6 months. Of these 25 athletes, nine athletes (36%) sustained hamstring injuries. At the time of data collection, all subjects recruited participated in full training free of any symptoms. Subjects were recruited in August 2004 for the preseason assessment period (defined as day 0 of the observed period) and were monitored until July 2005 (defined as the end of the season). Overall, there were 24 reported injury cases to different body parts within the study period. Hamstring injuries accounted for 50% of all injuries. The distribution of the injured body parts is shown in table 2. Twelve hamstring injury events were reported in eight athletes, with two athletes sustaining injuries to the hamstring twice and one athlete injuring his hamstring three times. All the recurrences occurred to the same injured leg. Six injuries occurred during training and six during competition. All injured athletes were men. The exposure time (in hours) was calculated by the total number of injuries recorded over the study period divided by the total exposure. An injury rate of 0.87 per 1000 h (training and competition) was calculated. Figure 1 illustrates the timing of the hamstring injury events over exposure time. The data show that the risk of injuries was much higher at the beginning of the season, with seven hamstring injuries occurring at the first 100 h of exposure. 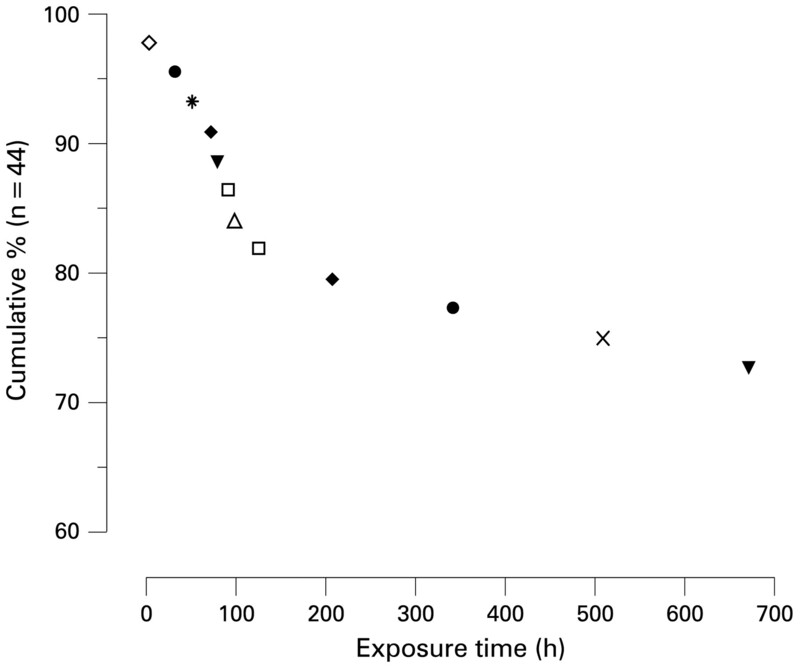 Reported hamstring injuries over exposure time (in hours) in this study. Each symbol represents one reported hamstring injury. Following hamstring injury, five (41.7%) received physiotherapy treatment, two (16.7%) received Chinese medicine and the rest of the subjects (41.6%) did not receive treatment. Injuries, on average, resulted in 16.3 days (SD 10.5) of lost time. The demographic data of the hamstring injury group and the uninjured group are listed in table 3. Independent sample t tests and χ2 analysis revealed no significant difference between the two groups. The preseason passive hamstring length (assessed by SLR), isokinetic quadriceps and hamstring profile and peak torque angle (assessed by isokinetic dynamometry) were examined to assess the association with hamstring injury. Independent sampled t tests were used to compare whether there was any difference within or between the uninjured and injured groups in (1) SLR; (2) peak torque; (3) peak torque angle; (4) Hcon : Qcon; (5) Hecc : Qcon and (6) H : H at three different velocities (60, 180 and 240°/s). No significant differences were detected. Cox regression analysis was used to determine the best predictors that possibly predict the occurrence of hamstring injuries based on the difference in exposure time. For each injury, the exposure time was calculated by the number of days between the preseason assessment and the injury date multiplied by the weekly training hours. All predictor variables (ie, those that were regarded as being related to hamstring injury) were first entered into the model. Using backward likelihood ratio analysis, only variables with an associated significance level less than p<0.25 were included in the overall model fit (table 4). Nine variables were subsequently included, conventional hamstring : quadriceps ratio at 180°/s (conventional H : Q180) was shown to be significant in predicting hamstring injury (p = 0.01). This result suggests that the risk of hamstring muscle injury increases with a decrease in conventional H : Q180. Further analysis revealed that a conventional H : Q180 ratio of less than 0.6 was found to increase the risk of hamstring injury by 17 times (p = 0.03, HR 17.4, 95% CI 1.31 to 231.4). Hamstring injuries in sports are multifactorial. The primary goal of this study was to examine the incidence and the modifiable intrinsic risk factors leading to hamstring injuries in competitive sprinters. To our knowledge, there have only been two prospective studies1821 that examined the risk factors associated with hamstring injuries exclusively in track and field athletes. The sprinters in our study were top-ranked athletes in Hong Kong and had participated in both national and international championships. The strength of the investigation is in its prospective study design. For the specific sport that we examined, the size of the cohort is smaller compared with that of the studies on team sports. However, subjects in the study constituted a very homogenous group with respect to age, training and competitive levels. It has to be noted that 58.4% of injuries occur at the first 100 h of exposure in our study. Based on the average weekly training hours (approximately 11.2 h), these injuries occurred during the first 10 weeks of the training/competition season. Although the details of the training sessions (ie, type, volume, intensity and frequency of training) were not collected for this study, this injury pattern would certainly become an important basis for planning preventive measures. This finding also suggests that the athletes were not adequately prepared at the beginning of the season when there was a transition to a greater amount of training and intensity. Along with a well-designed pre-season conditioning programme, it would make sense to conduct an evaluation programme targeted towards individual athletes. Few prospective studies have investigated the risk factors associated with hamstring injuries in competitive sprinters. Exposure time alone may not be the most important factor in determining injury risk in the sprint events. Hamstring injury was associated with a preseason low Hcon : Qcon ratio. Hamstring muscle weakness has been proposed as a risk factor in hamstring injuries but the results are contradictory. The prospective studies on track and field athletes1821 and footballers19 showed that the injured hamstring muscle had a significantly lower peak torque than the uninjured side. Conversely, this association between preseason muscle weakness and the subsequent occurrence of hamstring muscle strain was not supported in another prospective study.15 The authors in that study found no difference in the muscle strength when comparing the injured with the uninjured legs of football players. Other studies attempt to answer this question by providing preseason strength training and observe if this training could reduce the incidence of hamstring injuries. It has been shown that eccentric hamstring training,26 concentric and eccentric hamstring muscles training6 and a strengthening programme to restore the normal hamstring : quadriceps ratio27 led to a significant decrease in the hamstring injury rate in the following season. In our study, no significant difference in peak torque could be identified within or between the uninjured and injured groups. Strength imbalances between quadriceps and hamstring muscles have also been reported in the literature. Except one study,15 published data in the literature (including the current study) have showed that strength imbalances (ie, the hamstring : quadriceps ratio) to be a risk factor for hamstring injuries1819212829 It is uncertain why the findings from Bennell et al15 differ from other studies, despite the fact that their study was well designed and executed. Also, the possibility of publication bias against small studies with negative results cannot be ruled out. Our study showed that a conventional H : Q180 ratio of less than 0.6 significantly increased the risk of hamstring injury by 17 times. This corroborates with a similar prospective study on professional football players,19 in which the investigators found a substantially increased risk of hamstring injury when the hamstring : quadriceps ratio at 60°/s was less than 0.61. Knapik et al28 studied the correlation between preseason strength and flexibility in female collegiate athletes and found that a hamstring : quadriceps ratio of less than 0.75 at 180°/s increased the risk of lower limb injury. Although the study did not focus on hamstring muscle injury alone, the authors stated that a higher angular speed may be more compatible with the speeds during the athletic events. Different hamstring : quadriceps ratios were reported for different sports in the literature. A study on intercollegiate football players suggested a conventional hamstring : quadriceps of greater than 0.55 at 60°/s was a safe cut-off for returning to sports after injury.7 Comparatively, another study29 in professional football players determined a cut-off point to be 0.47 at 60°/s. The finding of differences in hamstring : quadriceps ratios among athletes in different sports30 (elite volleyball players and soccer players in this particular study) supports the notion that sports with different demands should not use the same hamstring : quadriceps ratio criteria. The functional hamstring : quadriceps ratio reflects the force-length and force-velocity properties of the agonist–antagonist knee muscle. In principle, this ratio is more useful in determining an injury risk because the relationship describes the ability of the eccentrically acting hamstring to brake the action of the concentrically contracting quadriceps fully at the late swing phase of the gait cycle. The question of why the concentric hamstring : quadriceps ratio, but not the functional hamstring : quadriceps is a significant risk factor is intriguing. Perhaps findings from a recent study27 may provide further insight into this aspect. This prospective study27 examined 687 soccer players and focused on strength imbalance as a predictor of hamstring injury. The results showed that subjects with a preseason strength imbalance (specifically the functional hamstring : quadriceps ratio) were 4.7 times more at risk of injuries. The investigators further convincingly showed that by normalising this imbalance verified by isokinetic testing, the injury incidence decreased significantly. Of particular interest is the fact that the cut-off values for the functional hamstring : quadriceps ratio was 0.98. In our study, the mean functional hamstring : quadriceps ratio at 180°/s for the uninjured athletes is 0.96 when compared with a ratio of 0.71 for the injured athletes. Although not statistically significant, but if we applied the strict criteria of the defined cut-off at 0.98 as in the study by Croisier et al,27 our subjects would be classified as having muscle imbalance associated with a higher risk of injury. Further investigation on muscle imbalances in sprinters is clearly needed. Other potential risk factors, including peak torque angle, hamstring flexibility and a history of previous injury were included in the analysis. A cross-sectional study on football players11 showed that muscle torque peaks at a significantly shorter length than that of non-injured muscles. Our study did not demonstrate a shorter peak torque angle in the injured group. Neither did we detect a significant difference in flexibility. A history of previous injury has been reported to be an important predictor of hamstring strain injury.151617 The incidence of previous hamstring injuries in our study group was 25%, which was lower than that reported in football players (34%).16 In this study, we were not able to detect the relationship between hamstring injury risk and a past history of hamstring injury. This study generally focuses on the intrinsic risk factors of hamstring injury. Investigation of the extrinsic risk factors such as running surface and shoe wear may need to be addressed to elucidate further the mechanism of injury. This is a 12-month prospective study undertaken to identify the incidence and the risk factors of hamstring injury in competitive sprinters. The results showed that a preseason hamstring : quadriceps muscle peak torque ratio at 180°/s of less than 0.6 increased the risk of hamstring muscle injury by 17 times. A preseason isokinetic screening will be useful to identify athletes at risk. Any athletes with a strength imbalance could undergo a strengthening programme to decrease the risk of hamstring injury.
. Hamstring injuries. Proposed aetiological factors, prevention and treatment. Sports Med 1985;2:21–33.
. Football injuries in Australia at the elite level. Med J Aust 1993;159:298–301.
. Hamstring muscle strain recurrence and strength performance disorder. Am J Sports Med 2002;30:199–203.
. Factors associated with hamstring injuries. An approach to treatment and preventive measures. Sports Med 1994;17:338–45.
. The role of warmup in muscular injury prevention. Am J Sports Med 1988;16:123–9.
. Isokenetic strength testing does not predict hamstring injury in Australian Rule footballers. Br J Sports Med 1998;32:309–14.
. Clinical risk factor for hamstring muscle strain injury: a prospective study with correlation of injury by magnetic resonance imaging. Br J Sports Med 2001;35:435–40.
. Relationship between hamstring strains and leg muscle strength. A follow-up study of collegiate and field athletes. J Sports Med Phys Fitness 1993;33:194–9.
. Shift of peak torque angle after eccentric exercise. Int J Sports Med 2008;29:251–6.
. Epidemiology of injuries in the Australian Football League, seasons 1997–2000. Br J Sports Med 2002;36:39–45.
. Preseason strength and flexibility imbalance associated with athletic injuries in female collegiate athletes. Am J Sports Med 1991;19:76–81.
. Isokinetic assessment of knee flexors and extensors in professional soccer players. Isokinet Exerc Sci 2003;11:61–2.
. Concentric quadriceps and hamstrings isokinetic strength in volleyball and soccer players. J Sports Med Phys Fitness 2004;44:119–25.
. Hamstring muscle tear with recurrent complains: an isokinetic profile. Isokinet Exerc Sci 2000;8:175–80. Ethics approval Ethics approval for the study was granted by the Hong Kong Polytechnic University.